Standing discreetly off Debruce Road, the river rock pillars and wrought iron gate at the entrance of Stoney End prepare visitors for the striking sight of the elegant 1920s stone and clapboard house that comes into view as they wind up the private driveway. The front entrance also evokes an earlier age: You enter under an arched stone portico stacked with firewood, and through a massive solid wood door to enter the bluestone-floored foyer. The space is perfect for hanging coats and gear and has a powder room off to one side. From the foyer, step into the heart of the house, with its large, open-plan living and dining room, punctuated on one side by two dramatic, arched French doors, and on the other by an oversize river rock fireplace. 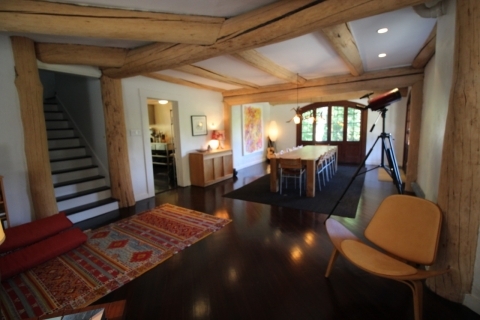 Exposed timber beams and columns and hardwood floors add to the rustic-chic sensibility. The large dining area, illuminated by heirloom antler fixtures, can seat 12 comfortably. Open the bi-fold French doors to a wraparound stone terrace to create a dynamite space for indoor/outdoor entertaining. The 800-square-foot terrace has an outdoor dining area, built-in flower beds, and two red awnings that can be opened for shade or during a sprinkle. The kitchen, located off the dining room, features restaurant-grade equipment and stainless steel counters, including a 6-burner gas range with flat-top/broiler, two ovens, under-counter wine/beverage refrigerator, and deep, double-bowl commercial stainless steel sink with pull-down spray faucet. Next to the refrigerator is a custom-built pantry with a set of deep slide-out shelves. The garage is off the kitchen, and the current owners have repurposed the space for easy-access laundry (washer, dryer, slop sink) and storage. Upstairs, a wall of closets with reclaimed wood doors lines a private corridor that leads to the luxurious master suite. The generous anteroom can be used as an office or sitting area. Then into the bedroom proper, where four windows on three walls create gentle cross-breezes and pleasing views of the rolling grounds. The master bath includes a claw-foot tub with rain shower and a heated towel rack. Another claw-foot tub appears in the first guest bedroom, where one can bathe while taking in the view. A dedicated half bath is just across the hall. 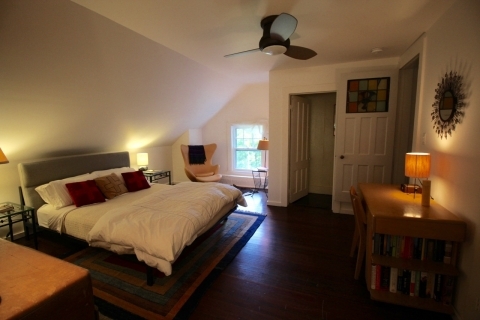 A second bedroom is tucked away a few steps down, cozy and charming thanks to its seating area and sloped ceiling. There is a private full bathroom with tub/shower, and a staircase that leads directly to the kitchen. Presumably this was where the help slept back in the day, but now would be considered a most desirable spot! An intriguing feature of this house is the third-floor garret. A narrow staircase leads up to an unfinished, full-height attic with interesting ceiling lines and a brick-lined chimney running up through the space. There is already an old bathroom up there (with yet another claw-foot tub). 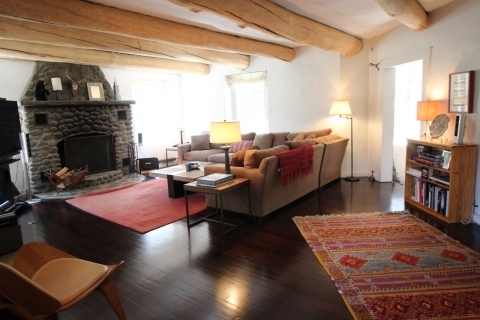 The attic has electricity, plumbing, and full-size windows, so the possibilities are many. 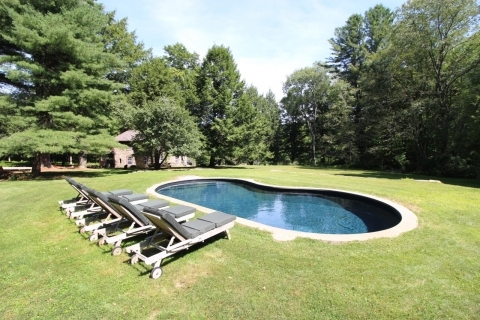 Back outside, a level lawn wraps around a heated, black-bottom pool with a saltwater filtration system. The depth runs from 3 to 5 feet—which the owners consider "cocktail depth," so one can socialize while standing in the water. The pool area is wired for electricity and audio to create another entertaining area. Off to another part of the property, bordering on the substantial woodland, is a fenced garden equipped with raised beds, lighting, and water supply. A covered area with picnic table provides respite from a rain shower or a great spot for lunch. Avid gardeners will appreciate the custom compost bin that has been successfully churning out gorgeous black soil from kitchen cuttings. The entire property is dotted with stacked-stone walls, walking paths, flower beds, and mature trees—including 80-foot white pines and other evergreens that guarantee seclusion and quiet, even in the winter months. Anyone who has searched the active listings in this region will surely consider this property an outlier for its striking architecture, estate-like setting, and desirable amenities. The location near Livingston Manor, a town currently experiencing a surge in popularity with new businesses, social events, and energy, should be considered another plus. 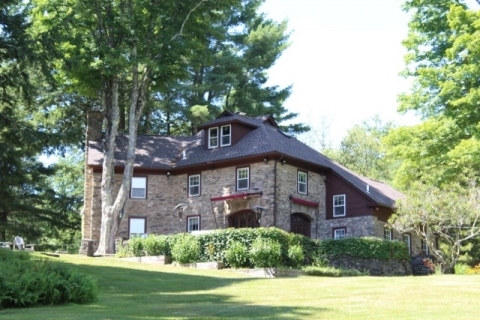 So should the property’s location within the protected lands of the Catskill Park, with its first-class trout fishing, hiking, skiing, and other outdoor activities. Country House Realty looks forward to sharing this special property.